for some time now and I finally have the mojo working to do it. mainly due to a thing that [icon]geewillicker[/icon] wanting to do pokémon birth and oviposition art. anyway, I'm not sure how many of these I will do, but there will be many eggs coming up and this will be updated. #01. a Shinx egg, and it's a revision of the one I did on FA. and honestly, I like how this one turned out. -Update 1- now for some official eggs! #02. an Eevee egg... the hardest part of this egg is the thick green zigzag pattern in the middle. I feel really good with how this looks, especially since May had this very pokémon egg that turned Eevee and evolved into a Glaceon. #04. a Mudkip egg, because people liek Mudkips. plus Brock had a Mudkip that evolved into Marshtomp. #05. a Larvitar egg. plain jade green, nothing fancy. -Update 2- now some more custom eggs! #07. a Purrloin egg. simple enough, really. 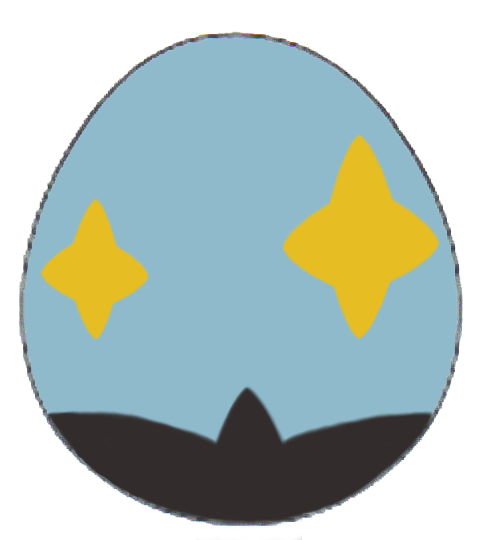 #09. a Skitty egg, and that crescent moon being put on this egg made things rather tedious... so I managed this way. #10. last for this round, a Meowth egg. I used a page from The Cat's Meowth to get the charm shape and shines down, but other than that, I'm happy with it.